This week we’ve got some exciting news to share with you! The World Association of Journalists of Wine and Spirits announced a few weeks ago their World Rankings for extra virgin olive oil. These are based on a system in which each olive oil amasses points based on analysis of 28 international competition awards. We are very proud that our Lemongrass and Tarragon Olive Oil received the highest ranking in the 2018 Condimento – Flavored Evoo category. And you have to consider, this was amongst more than nine thousand samples of olive oils from 30 countries! This is the first time that a Greek olive oil lands on the first place in this category. This is also the fifth international award that our Lemongrass and Tarragon Olive Oil receives in 2018. 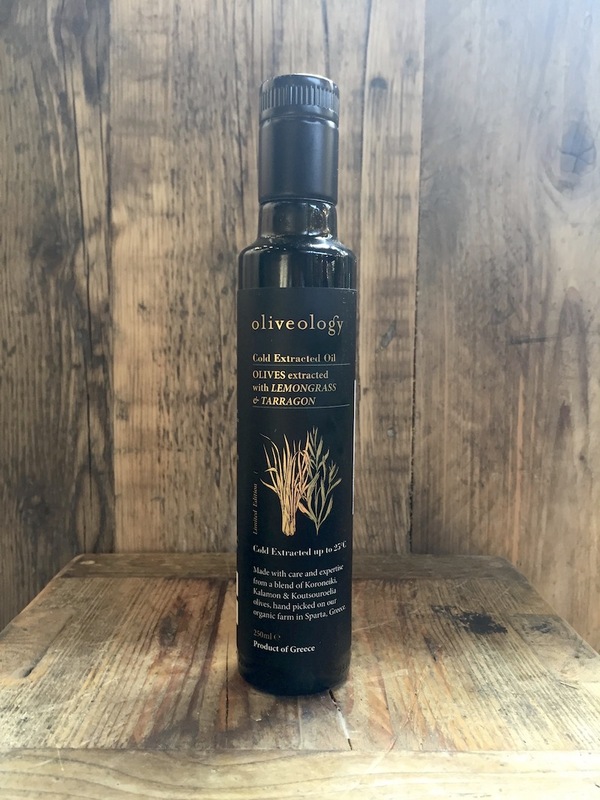 Our Lemongrass and Tarragon Olive Oil is a special oil is made from semi ripe olives crushed with fresh lemongrass and tarragon. We use 1200g of semi-ripe olives to produce 100ml of this cold extracted oil. It is produced in Sparta using exclusively koroneiki olives, kalamon olives and koutsouroelia olives. It has a very fresh flavour and intense aromas. And it pairs perfectly with fish and green vegetables. 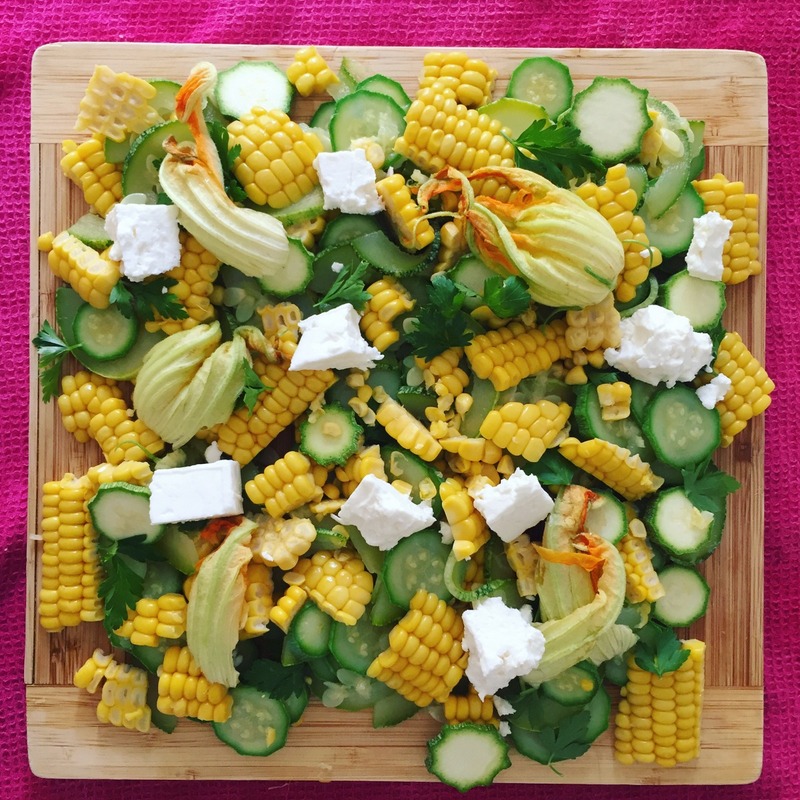 We have already prepared a vibrant zucchini, corn and feta salad with Lemongrass and Tarragon Olive Oil. Stay tuned for many more recipes using our newly awarded Olive Oil! This week we’ve got a special olive oil in store! It is our Lemongrass and Tarragon Olive oil. This special oil is made from semi ripe olives crushed with fresh lemongrass and tarragon. We use 1200g of semi-ripe olives to produce 100ml of this cold extracted oil. It has a very fresh flavour and intense aromas. And pairs perfectly with fish and green vegetables. Think of some grilled whole sea bass. Or some steamed cod. Freshly cut crunchy vegetables. This olive oil. But we will not prepare fish this week. How are we going to use it? We are making a very summery salad. With zucchini, corn and feta cheese. The combination of flavours is familiar, but this flavoured olive oil takes it to a whole other level. We used corn on the cob because it’s in season. Please do, it’s easy to handle and tastes so much better than the frozen or tinned one! Place the corn in a large pot of salted water. Bring to the boil, then lower the heat to medium and cook until the kernels are tender, around 20 minutes. Remove and let cool. Once the corn is cool enough to handle, remove the kernels. To do so, place your corn vertically against your chopping board. Running the knife parallel to the corn, remove all kernels. They should fall on your board. Collect and place in a large bowl. Cut your zucchini in thin rounds. Blanch for 5 minutes –or until tender- in a large pot with boiling salted water. You can use the water from the corn. Drain and place in a large bowl with ice water to cool it down. Drain again. You can skip this step and just use raw zucchini. Place your zucchini in the bowl with the corn. Add the feta cheese, parsley and zucchini blossoms (if using). Season with salt, flavoured oil and lemon juice. Gently toss everything together. Serve with more lemon juice and flavoured oil.